Welcome to Hotel Olimpia: your hotel in the heart of the Queen of the Dolomites! 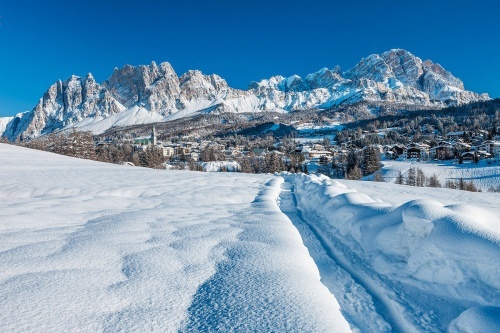 Set in a highly central location just 50 metres from Cortina’s renowned Corso Italia – the finest pedestrian shopping street in the Dolomites – and from the ski lifts of the Faloria ski area, Hotel Olimpia awaits you for a relaxing holiday in stunning Cortina d’Ampezzo. The breath-taking beauty of the Dolomite mountains surrounding Cortina have always attracted sports enthusiasts, not to mention those that simply want to soak up the superb views and the thrill of the location. Skiing, trekking and cycling, but also shopping, leisure and food… all passions that can be conveniently experienced when you stay at Hotel Olimpia. ... for a truly relaxing holiday! Thanks to its position, the relaxing atmosphere and the warm welcome, Hotel Olimpia is perfect for a holiday in Cortina both in winter and in summer. The hotel’s rooms – most of which have recently been renovated – combine traditional local style with modern convenience, and are practical and comfortable. In the morning, start the day on the right foot with a varied sweet and savoury buffet breakfast. In the afternoon, before going out to savour the “dolce vita” Cortina offers, why not try a regenerating experience in the hotel’s small wellness centre with jacuzzi, Finnish sauna and relaxation area with herbal teas. We look forward to seeing you at Hotel Olimpia, where you can forget all about daily routine and immerse yourselves in the unique, charming atmosphere of the Queen of the Dolomites.